Rich with elegant details, tastefully furnished, the apartment is a spacious one bedroom apartment (60 sqm) air conditioned and equipped with every comfort. It is composed of: 1) a large and bright living room with a convenient kitchenette and dining area, television, wireless plant and sofa bed, and 2) a large room with double bed (single bed can be added), and an elegant bathroom with shower. Prices are for two people. For each additional person plus EUR 10 per night. Ideal for families or groups of up to five people. 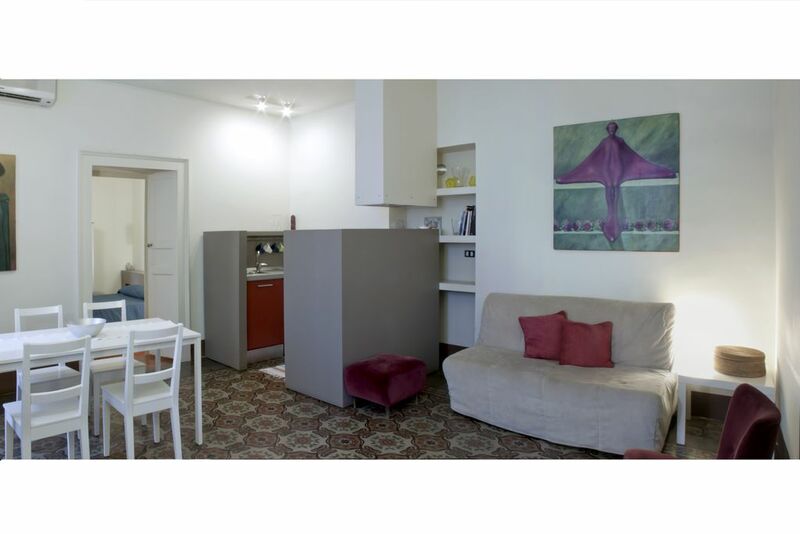 This comfortable apartment is located in the heart of the historic center of Catania, 400 meters from Piazza Duomo and the Ursino castle, 300m from the Benedictine Monastery and the Roman Theatre and Odeon. We loved our stay at Tre Vie. The apartment is very attractive and spotlessly clean. It is well located, within walking distance of all the historic sites in the Old City. There are two grocery shops close by and many restaurants. We arrived by car and Giovanni graciously let us use his garage as there is virtually no parking on the street. Giovanni was one of the best, if not the best, reason we loved the apartment. Before we arrived he quickly and patiently answered all my email questions and concerns. Once we were at the apartment Giovanni guided us on places to see, different types of restaurants and even called taxis for us and made tour reservations. Our vacation in Catania would not have been as wonderful without Giovanni and Tre Vie. We stayed a couple of days in this apartment. The flat is functional and clean and features very nice paintings and its mini-kitchen & facilities are of good standard. Especially the patio is very cousy and pleasant! The location is very centric. This is good because you can walk into many places and there are many shops & restaurants nearby. But it can also be a downside if you have small children as we had. The adjacent Garibaldi-street is very busy and you have to watch out the traffic. There is also no elevator, but the apartment is on the 1st floor. All in all, we enjoyed our stay in Giovanni's flat and he was very flexible & friendly and helped us out in our travel problems not regarding to this flat, so thanks a lot! to stay in Catania. The appartment is great and there is everything You need. Its possible to walk to all intersting places and get public transport if You plan to visit other cities. Owner is responsive and helpful. Great location, next to the fish market, historical sites within walking distance, close to shops and restaurants. The apartment is cozy, clean, interesting decorated interior, plenty of space and great balconies from which you can observe the life of the citizens. Affable host, ready to help with any questions. Great place for a starting point of traveling to Sicily! Etna, Taormina, Siracusa, Palermo, Messina. Near bus and train station. Many thanks to Giovanni! The apartment was functional, well furnished and above all very cozy. The city center was just around the corner, but on the other side we were able to relax both in the apartment and in belonging to it comfortable terrace. The owner was helpful and made some inspiring suggestions about how to explore Catania. "Very stylish apartments in historical center of Catania. Apartments are well equipped with fresh renovation and interesting design. Owner is open for all requests and very helpful. House is located in historical part of Catania with 5-10 minutes by walk to central area." It is easily accessible from the airport (only 5 km away) in car or taxi (about 20 Euros) or by bus (No. 457 or 924 to Piazza Borsellino) in 20 minutes. Is possible to park your car in a private garage near the building at a cost of 7 euro per day. A few meters from the apartment you can immerse yourself in the heart of the nightlife thanks to the 150 pubs in the area: our explosive city will offer you plenty of entertainment until the early hours of the morning. With its many theaters, cinemas, restaurants, bar (open during the night) and various entertainment venues. The prices are calculated for two people and are approximate (may vary from period to period). For each additional person plus € 8 per night. Per week plus € 30 for cleaning. Deposit on the arrival at the apartment (100€), payment method: Cash. Refund on departure of the apartment. Are included bed and bath linens, use of light, water, gas and internet access. Tariffe in funzione del numero di persone. Consegna delle chiavi da parte del Proprietario. E' previsto il versamento di una cauzione in contanti all'arrivo di EUR 100 che verrà restituita alla partenza. Tassa di soggiorno obbligatoria di EUR 2 a persona per le prime 4 notti. Sono comprese tutte le spese di luce, acqua, gas, riscaldamento, internet.